Correction: The NAACP was not listed among march sponsors when this was published. It since has returned. But in recent weeks, a slew of prominent liberal groups has – mostly quietly – withdrawn their support for the national Women's March. The third march is scheduled for Saturday. 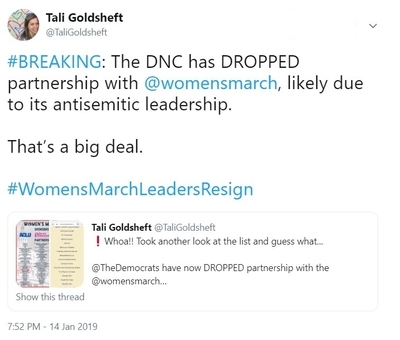 It apparently will take place without support from the Democratic National Committee (DNC), the Southern Poverty Law Center (SPLC), Emily's List and the National Organization for Women (NOW). March leaders have struggled to put accusations of anti-Semitism behind them since February, when Nation of Islam leader Louis Farrakhan gave a speech calling Jews "powerful" and "Satanic" and saying they "are my enemy." March co-president Tamika Mallory, who has called Farrakhan the "greatest of all time," was present for the speech. She has refused to condemn Farrakhan's anti-Semitism and homophobia, most recently during an appearance Monday on "The View." The most Mallory would say is she does not use the kind of rhetoric Farrakhan espouses, but "I called him the greatest of all time because of what he's done in black communities."